Boron-nitrogen co-doped graphene nanoarchitectures were synthesized by annealing a freeze-dried precursor containing exfoliated graphene oxide (GO) nanosheets, ammonium borate, and polyvinyl alcohol (PVA). The microstructures and composition of nanocomposites were optimized and characterized systemically. Effects of a doping element on the electrochemical performances and interface compatibility were evaluated. The restacking of exfoliated graphene nanosheets was hindered effectively by the ultra-fine carbon clusters formed via the thermal decomposition of PVA. Such a three-dimensional structure favors the fast mobility of electrolyte ions. In addition, the co-doping of N and B elements not only increases interface compatibility between ionic liquid electrolyte and graphene but also supplies extra pseudocapacitance. Benefiting from the integrated merits, the optimized nanocomposites could deliver a specific capacitance of 35.4 F g−1 at 1 A g−1 and present a maximum energy density of 78.7 Wh kg−1 with a power density of 2043 W kg−1. 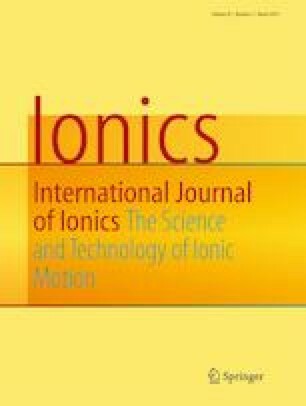 Due to the formation of more decoupled ions in ionic liquid electrolyte at elevated temperature, the symmetric supercapacitors based on the as-formed nanocomposite exhibit a maximum energy density of 134.6 Wh kg−1 at 60 °C. This work was financially supported by the National Key Research and Development Program of China (2016YFB0100303), Key Research Program of Frontier Sciences (QYZDY-SSW-JSC011), and the National Natural Science Foundation of China (No. 21878308). Prof. Suojiang Zhang (IPE, CAS) is sincerely appreciated for his careful academic guidance and great support.